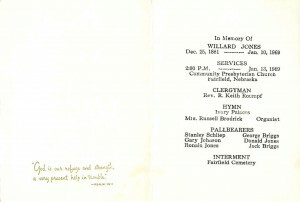 A service of worship in memory of Willard Jones of Fairfield was held in the Fairfield Community Presbyterian Church on Jan. 13 at 2 p.m. Rev. R. Keith Roumpf conducted the services. Mrs. Russell Broderick was organist. Pallbearers were George Briggs, Jack Briggs, Norman Jones, Donald Jones, Ronald Jones and Stanley Schliep. Interment was in the Fairfield Cemetery. Arrangements were by McLaughlin Funeral Home. 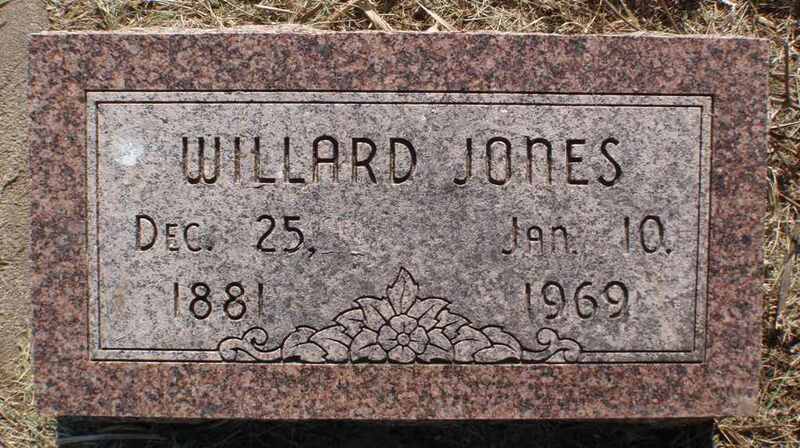 Willard Jones was born on Dec. 25, 1881. He was the son of George Thomas Jones and Margaret Standard. 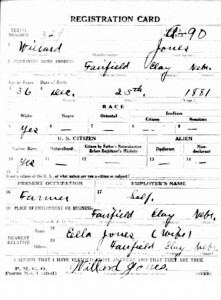 He was raised on a farm near Fairfield. 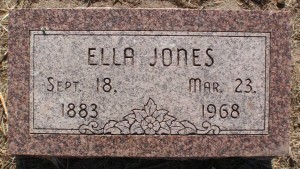 Mr. Jones had four brothers and five sisters, all of whom preceded him in death. 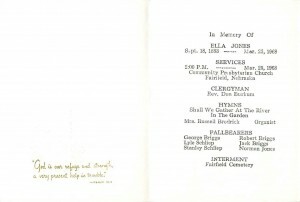 On Nov. 25, 1908 Mr. Jones took as his bride, Ella Smith. This couple lived all of their married life around and in the Fairfield community. They were very much a part of a generation that knew little besides hard work and love shared in raising a family. 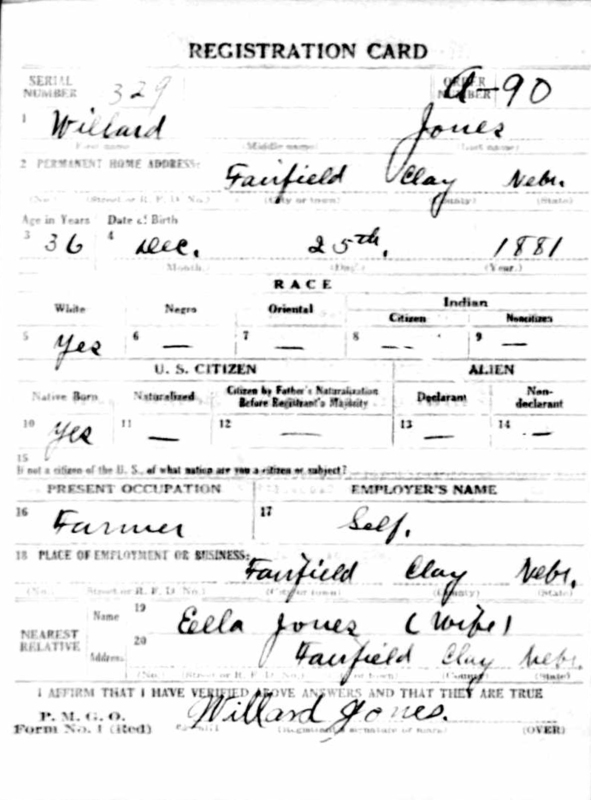 Willard always took pride in farming with harses and kept a team for plowing gardens long after his retirement. 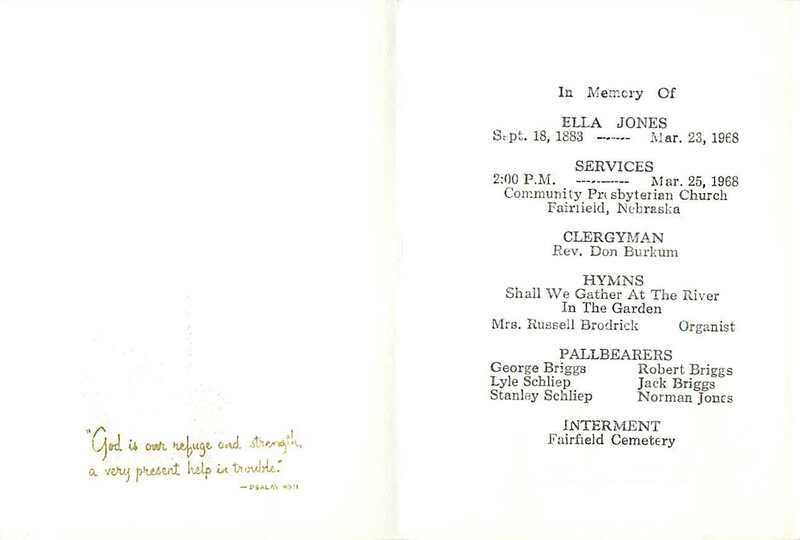 Mr. Jones was a member of the former Congregational Church of Fairfield. He was preceded in death by his wife less than a year ago. 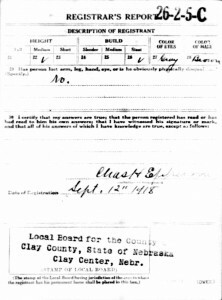 Surviving are six children: Mrs. Audrey Egan of Ayr, Wendell of Jerome, Ida. 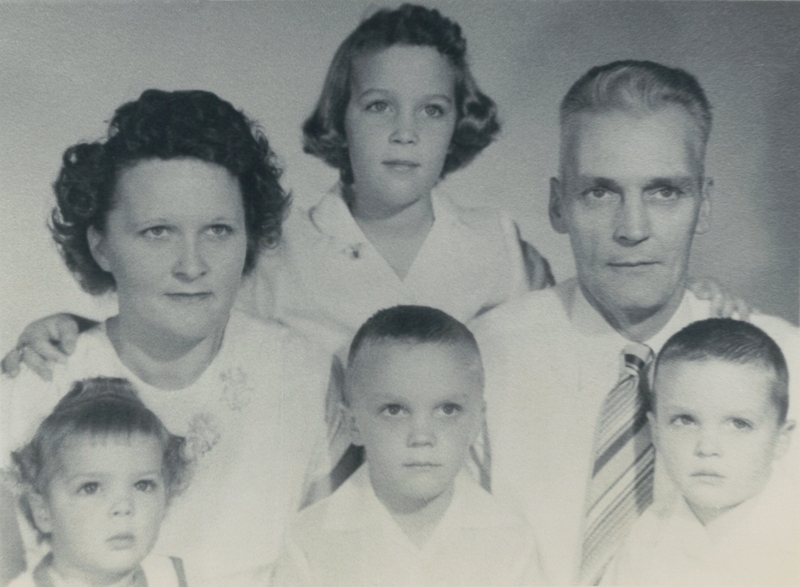 ; Vilas of Mullen; Mrs. Berdena Schliep of Clay Center; Mrs. Velma Briggs of Hastings and Mrs. Virginia Hatman of Wynnewood, Okla. Twenty grandchildren and ten great grandchildren and several other relatives and friends survive to mourn his passing. Funeral services were held on Thursday afternoon, May 16, for Vilas H. Jones, 60, who died on Monday, May 13 at the Pioneer Memorial Hospital. 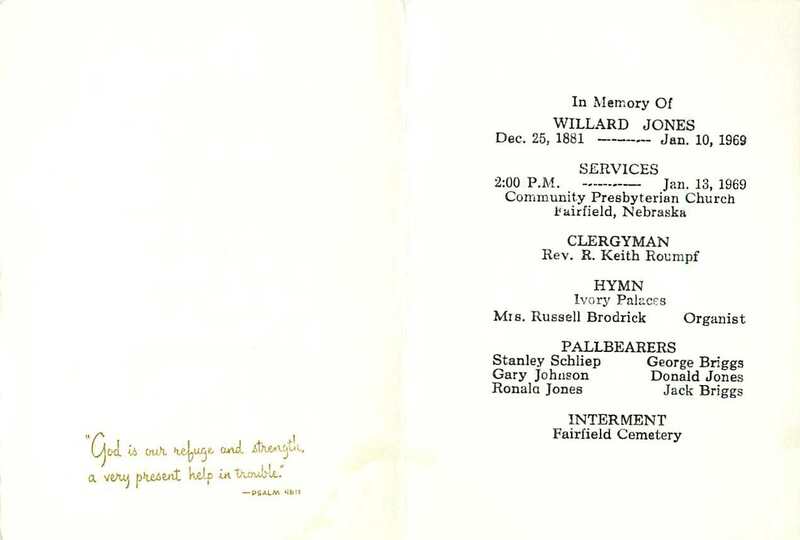 Services were held form the United Methodist Church at Mullen with the Rev. Dwight Kemling officiating. Mrs. Doris Miller and Wayne Hampton furnished the music, with the songs, “Precious Memories” and the “The Lord’s Prayer”. 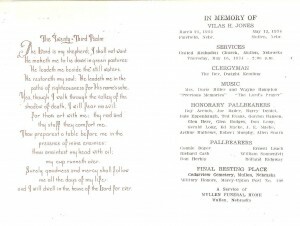 Honorary pallbearers were Roy Arends, Joe Bader, Harry Deidel, Dale Eppenbach, Ted Evans, Gordon Hansen, Glenn herr, Glen Hodges, Don Long, Gerald Long, Ed Macke, J.E. Macke, Arthur Mathews, Robert Murphy and Allen Smith. 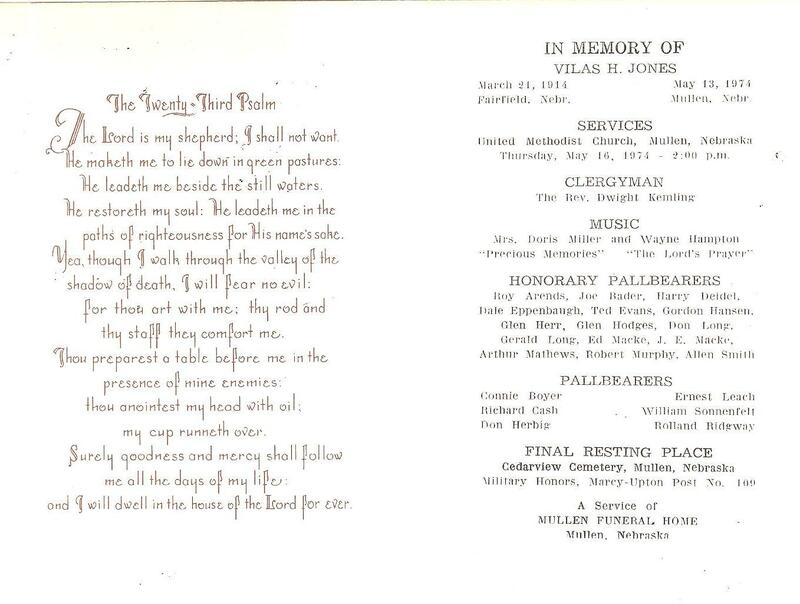 Active pallbearers were Connie Boyer, Richard Cash, Don Herbig, Ernest Leach, William Sonnenfelt and Rolland Ridgway. Interment was in the Cedarview cemetery at Mullen with Marcy-Upton Post 109 of the American Legion furnishing the military honors. 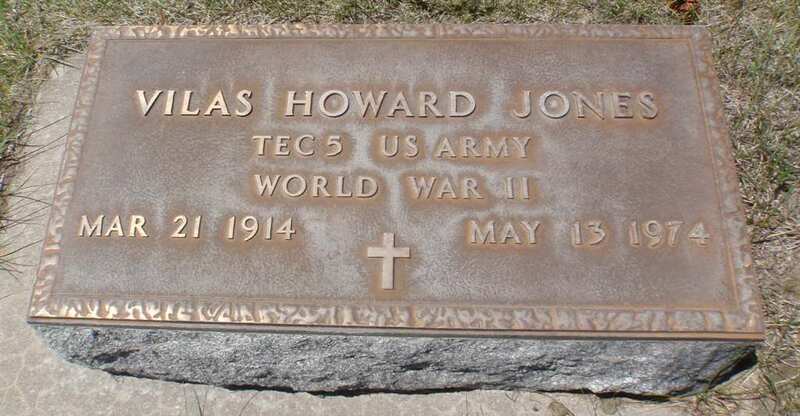 Vilas Howard Jones, the son of Willard and Ella Jones, was born on a farm near Fairfield, Nebr., on March 21, 1914. He attended school there and graduated from Fairfield high school in 1932. He came to Mullen in March, 1946 with the United States Geological survey. He was in partnership in a grocery store for a short while and then took up the work of an automobile mechanic, being employed for many years in the Chevrolet garage. 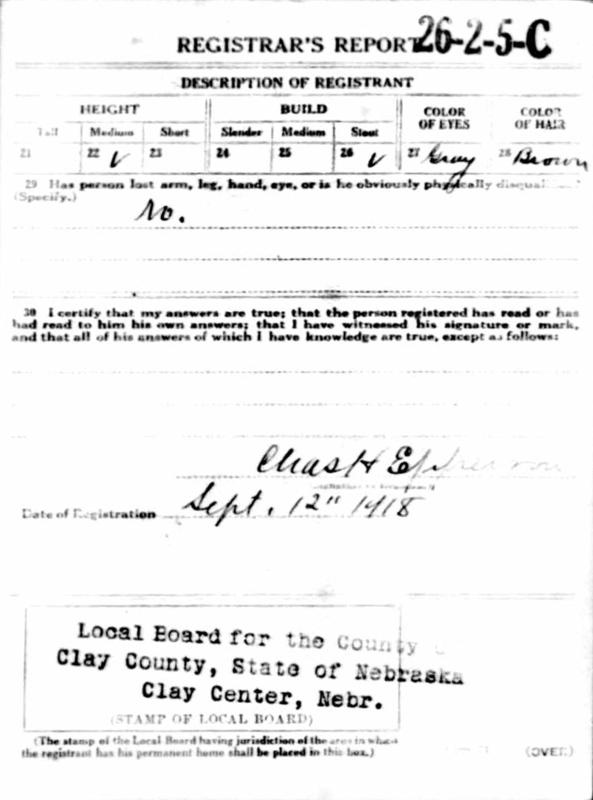 Shortly before his final illness he began to work for the Nebraska Department of Roads. He was married to Neva Little on August 5, 1946, and four children were born to this union. Mr. Jones was a member of Marcy-Upton Post 109 of the American Legion at Mullen and Lewis Trobough Post 256 at Fairfield. He joined the United Methodist Church at Mullen in 1959. He was preceded in death by his parents and a sister, Velma Briggs. 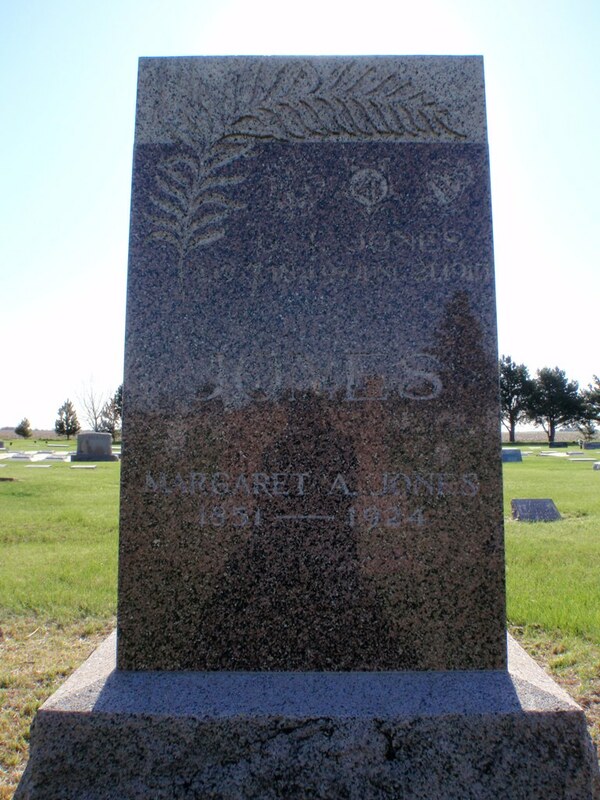 One brother, Wendell of Jerome, Idaho; and sisters Mrs. Ed (Audrey) Egan of Ayr, Mrs. Raymond (Berdena) Schliep of Clay Center and Mrs. Virginia Hatman of Wynnewood, Okla.
Neva June Andrews, 76, of Mullen died April 14 2004 at Hillside Estates in Curtis, Nebraska. 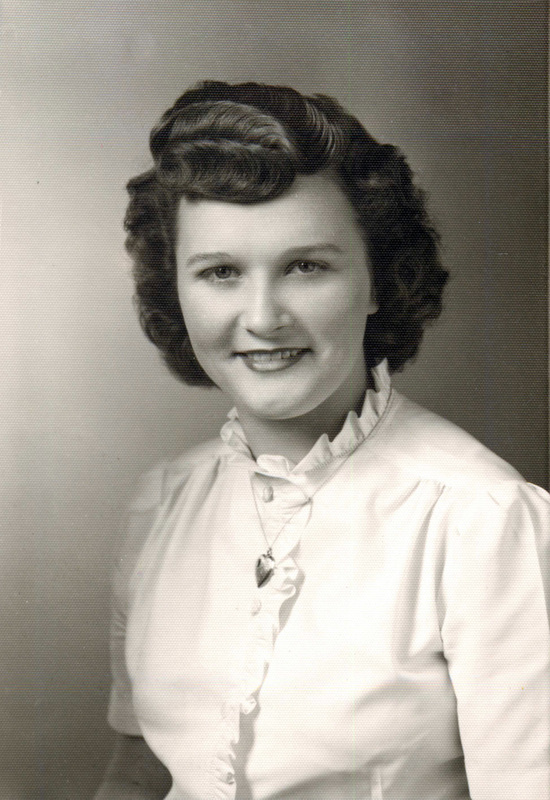 She was born June 11, 1927 to Carl and Teenie (Long) Little in Cherry County. She attended rural school and graduated from Mullen High School. 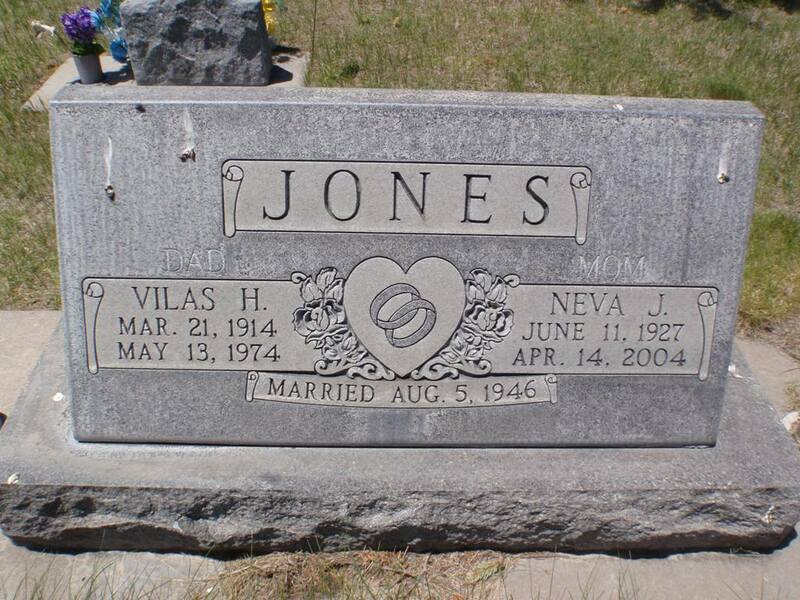 Neva married Vilas H. Jones of Fairfield, August 5, 1946 in Kansas. He preceded her in death in 1974. To this union four children were born Bonnie, Donald, Ronald and Vonnie (Jeanie). 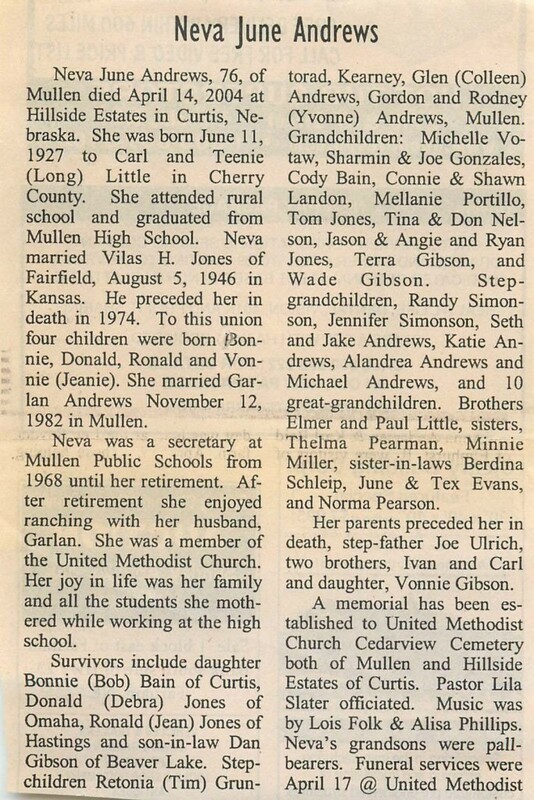 She married Garlan Andrews November 12, 1982 in Mullen. Neva was a secretary at Mullen Public Schools from 1968 until her retirement. After retirement she enjoyed ranching with her husband, Garlan. She was a member of the United Methodist Church. Her joy in life was her family and all the students she mothered while working at the high school. Survivors include daughter Bonnie (Bob) Bain of Curtis, Donald (Debra) Jones of Omaha, Ronald (Jean) Jones of Hastings and son-in-law Dan Gibson of Beaver Lake. Stepchildren Retonia (Tim) Gruntorad, Kearney, Glen (Colleen) Andrews, Gordon and Rodney (Yvonne) Andrews, Mullen. Grandchildren: Michelle Votaw, Sharmin & Joe Gonzales, Cody Bain, Connie & Shawn Landon, Mellanie Portillo, Tom Jones, Tina & Don Nelson, Jason & Angie and Ryan Jones, Terra Gibson, and Wade Gibson. Step-grandchildren, Randy Simonson, Jennifer Simonson, Seth and Jake Andrews, Katie Andrews, Alandrea Andrews and Michael Andrews, and 10 great-grandchildren. Brothers Elmer and Paul Little, sisters, Thelma Pearman, Minnie Miller, sister-in-laws Berdina Schleip, June & Tex Evans, and Norma Pearson. 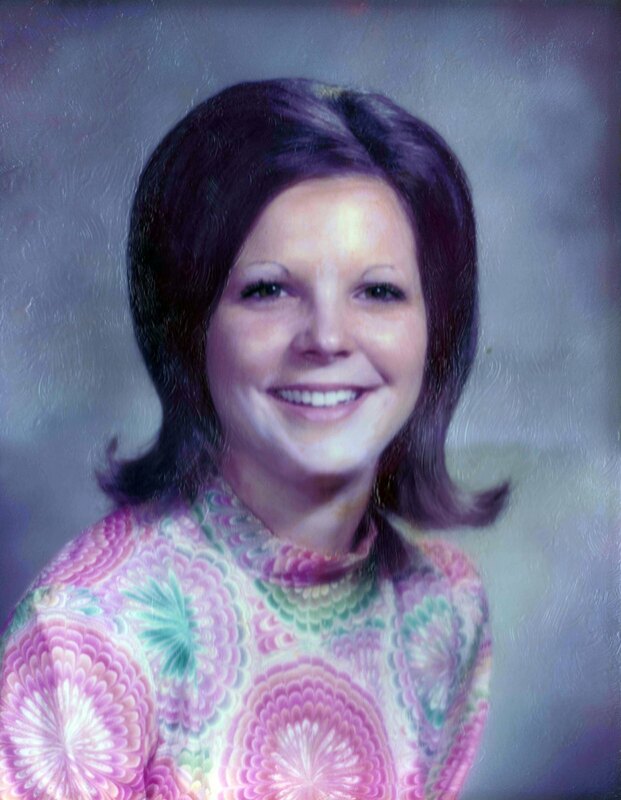 Her parents preceded her in death, step-father Joe Ulrich, two brothers, Ivan and Carl, and daughter, Vonnie Gibson. A memorial has been established to United Methodist Church Cedarview Cemetery both of Mullen and Hillside Estates of Curtis. Pastor Lila Slater officiated. Music was by Lois Folk & Alisa Phillips. 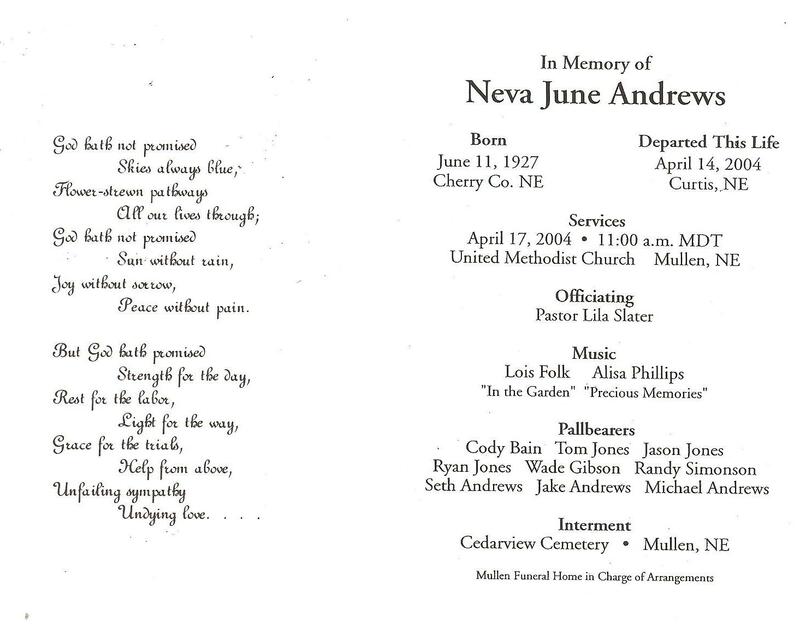 Neva’s grandsons were pallbearers. 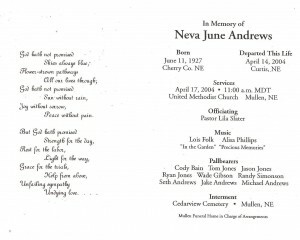 Funeral services were April 17 @ United Methodist. 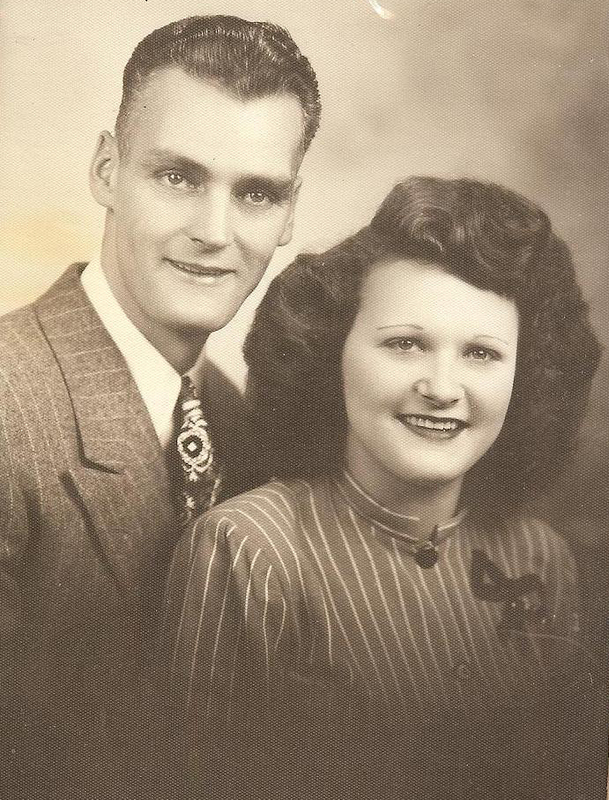 Garlan Lucien “Rusty” Andrews, 84, of Mullen, died May 26, 2012, at Pioneer Memorial Rest Home. Garlan was born in Seneca on June 19, 1927, to Lucien and Vera (Johnson) Andrews. 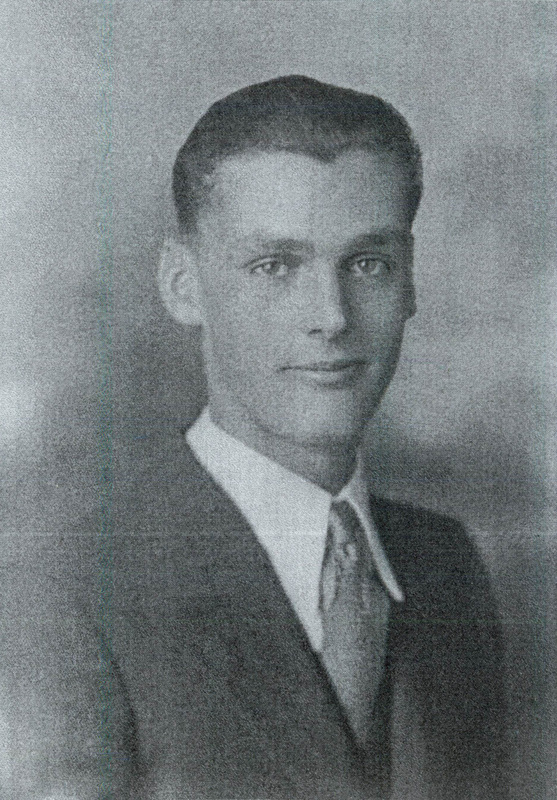 Garlan “Rusty” graduated from Mullen High School in 1945. He joined the army during the Korean Conflict in October 1950 and was discharged in August 1956. On Dec. 9, 1953, he married Kathryn Sweet. 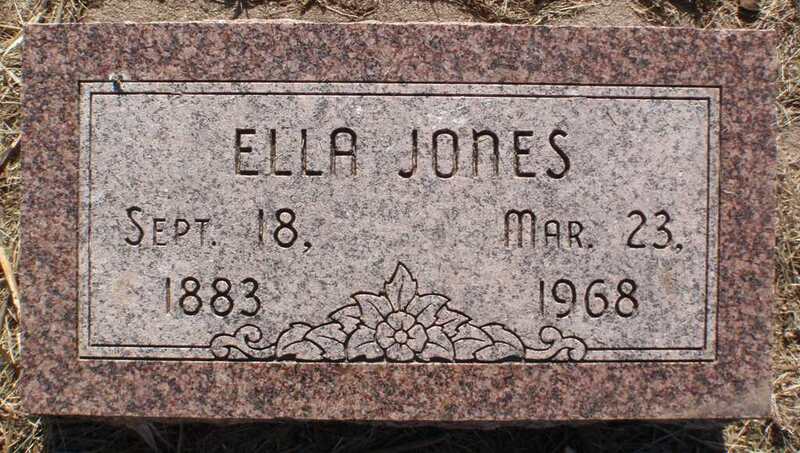 She died July 13, 1963. Three children were born to this union. He leased and ran his father’s, Lucien, ranch 18 miles north of Mullen. He lived there until his retirement in 1994. He moved into Mullen and resided there until going to the Rest Home. He was a member of the Mullen VFW No. 5541 and American Legion Post No. 109. He served on the Episcopal Church board and District No. 98 School Board. He loved ranching, fishing, hunting and softball. He especially loved food and family get-togethers. Survivors include daughter, Retonia (Tim) Gruntorad, of Kearney; sons, Glenn (Calleen) Andrews, of Gordon, and Rodney (Yvonne) Andrews, of Mullen; seven grandchildren; and one great-grandson; sisters, June (Tex) Evans, of Mullen, and Norma (John) Pearson, of Fallbrook, Calif. In addition to his first wife; he is preceded in death by parents, Lucien and Vera Andrews; wife, Neva (Little Jones); sisters, Esther Jensen, Betty Brannan and Eula Fosdick. Services will be at 10:30 a.m. (MDT) on Friday, June 1, at the Methodist Church in Mullen. Inurnment will be at the Cedarview Cemetery with military honors. Mullen Funeral Home is in charge of arrangements. 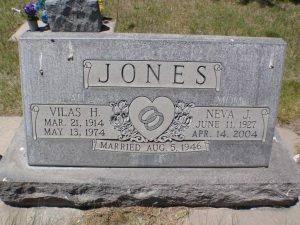 This is Vilas and Neva Jones gravestone in Cedarview Cemetery, Mullen, NE. 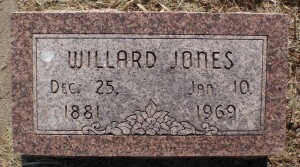 This is Willard and Ella Jones gravestones in the Fairfield Cemetery, Fairfield, NE. This is George T. and Margaret Jones gravestone in the Fairfield Cemetery, Fairfield, NE.